This tour departs at 8:45 am, 11:30 am and 1 pm daily. This tour takes place daily throughout the year. The ferry ride is generally more pleasant between April and October. We are comparing Statue of Liberty Pedestal, Ellis Island and Pre-Ferry Tour Prices from leading ticket suppliers and Try to find you Cheap tickets prices on the market. This package is an ideal opportunity to visit and acquaint yourself with Battery Park (Manhattan), Liberty Island and Ellis Island. The duration of the Battery Park guided tour is around 30 minutes. The self-guided tour with audio-guide of the Liberty Statue will be the second stop on this tour. The last stop on this tour is on Ellis Island where you will visit the National Immigration Museum before returning to downtown New York by ferry. The optional upgrade to a fully-guided tour adds the visit to the 9/11 Memorial in Manhattan upon the return from Ellis Island. This entertaining and insightful activity is suitable for everyone who is curious about New York’s top attractions and history. The tour is also suitable to all ages and people with average fitness levels. Your Experience With Statue of Liberty Pedestal, Ellis Island and Pre-Ferry Tour? Take a guided tour of Battery Park in the southern part of the island of Manhattan. Learn interesting stories and a unique history of this site. Benefit from the priority boarding on the ferry that will take you to Liberty Island. Enjoy a self-guided tour of the grand monument. Cross to Ellis Island and trace the history of immigration to the U.S.A.
Or, opt to book a fully guided tour in English for more personalised version of this tour. What Statue of Liberty Pedestal, Ellis Island and Pre-Ferry Tour Includes? A 30-minute tour of Battery Park in lower Manhattan. Priority boarding tickets to the ferry that operates to Liberty Island. Access to the Lady Liberty and the Pedestal Museum. A visit to the Ellis Island National Immigration Museum. Audio guides for your visits to the National Monument of the Statue of Liberty and the National Immigration Museum on Ellis Island. Battery Park, Liberty Island, Ellis Island and, optionally, the 9/11 Memorial. Prepare to overcome around 360 steps if you wish to get to the Lady Liberty's crown. You may take only hand baggage, such as small purses and camera bags, in the Statue of Liberty. In the case that you have some large baggage you can use the onsite lockers for $2 for 2 hours. Travelers Reviews about Statue of Liberty Pedestal, Ellis Island and Pre-Ferry Tour? Tourists that booked this combined tour via Get Your Guide rated the experience with 4.6 out of 5-stars. 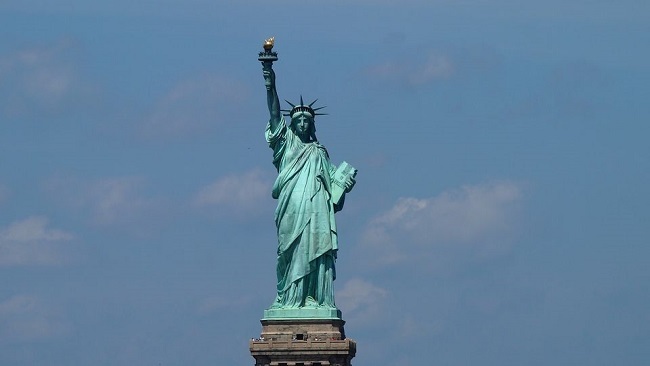 Meanwhile, Liberty and Ellis Islands have been rated as 4.5 to 5-star attractions on TripAdvisor. Most travellers who booked this activity commend their guide and his performance. In general, the reviewers underline that they had a very educational experience and learned a lot about the related points of interest. Besides being educational, some tourists describe the tour as quite entertaining. The tour is accessible to people with reduced mobility and wheelchair users, with the exception of the Statue of Liberty's pedestal. You must bring either a paper or mobile voucher in order to take part in this guided or self-guided activity. If cancellations are made the specified number of days in advance (depending on the ticket provider’s cancellation policy), you will receive a full or partial refund. Make sure that you arrive on time because your guide will not wait and you won't be able to catch up. The security check on a ferry port is similar to that of the airport, so inappropriate items are likely to be confiscated. There is a moderate amount of walking involved so you should wear comfortable shoes. Meeting Point: 24 State Street address, next to Starbucks.